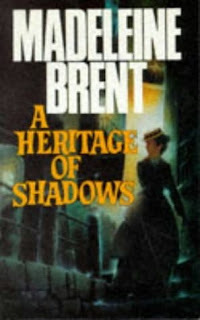 Awhile back, Rachel over at Rachel Reads mentioned Madeleine Brent--an author I'd never heard of before. I read Rachel's reviewof Moonraker's Bride and decided to go find it based on her 9.5/10 rating and the fact that the cover image she posted reminded me of several of my more beloved Mary Stewart paperbacks.Moonraker's Bride was checked out, but my library did have a copy of A Heritage of Shadows which looked intriguing enough for me. The story follows young Hannah MacLeod who has lived more life in her eighteen years than most have by the time they're fifty. When the tale opens she is working twelve hours a day at a small bistro in Montmartre, living in a one-room apartment that ranks just above a garret, and is pleased as punch to be doing so. Her perplexing attitude is explained through the hinting of some horror in her past which led to her fleeing her native England for Paris and the comforting anonymity of her current life. She has no family and only one friend, one Toby Kent, a boisterous sailor/impressionist painter who is gone for months at a time but when he's in town provides some companionship and a nice dinner or two. In return for this, Hannah cleans his clothes and sits for the occasional portrait. Unfortunately for Hannah and, as any suspense novel reader knows, self possessed but mysteriously haunted young women of independent means can never outrun their past for long. Events overtake Hannah and she is forced to return to England in an attempt to avoid disaster. She takes refuge teaching French to a rich merchant's two teenage children. The rich merchant, however, seems to know of her past and soon Hannah is caught up in a play for power and revenge that stretches back for decades and somehow involves her. Eventually we learn just exactly how heavily Hannah paid for her self possession and how much more she is forced to pay the demons that haunt her. This book was like popping a particularly fine piece of foreign chocolate in your mouth. The layers that emerge, one on top of another, alternately surprise and delight you. I felt very protective of and close to Hannah and any scene Toby was in made me laugh. Which was a good thing because Hannah's story ended up being much darker than I was expecting and the moments of humor were much appreciated. A sweet, enjoyable read. I went back to the library today and got two more Brent books. Angie, I'm glad you liked Brent! (And I love those 1970/80s covers, too.) Your description of how the story is so layered is a great observation. I really did like it, particularly that is surprised me in several places. Thanks for the rec!